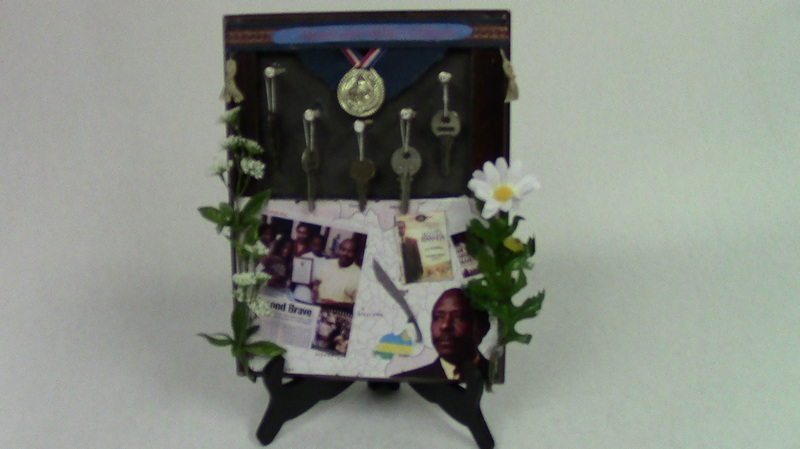 This shadow box represents Paul Rusesabagina’s genocide story. He is still alive, so it is a commemoration of his heroism. The keys may seem strange, but they symbolize Paul’s hotel, the Hotel des Milles Collines. He saved thousands of people there, so the keys are an important part of this. The medal is a recreation of a medal that he won, the President’s Medal of Honor for saving so many lives. There is a map of Rwanda in the background of the pictures, which is where the Rwandan genocide took place. There are many pictures on the map. These include pictures of Paul, his family, the book that he wrote, a movie poster based on that, and a machete. The machete was the most popular weapon of the Rwandan genocide. The flowers are just another acclamation of Paul Rusesabagina’s amazing accomplishments. Paul sat worriedly in his hotel with his family and over a thousand other refugees. He was worried because all of these people, including his family, had big targets on their heads. He knew he had to protect them at any cost. Paul was in the middle of a deadly genocide. Here’s how it started: There are two groups in Rwanda, the Tutsis and the Hutus. There are many stereotypes about the two groups such as the Tutsis having lighter skin, being taller, and having long, pointed noses. However, according to Paul Rusesabagina, these stereotypes are not true, only myths and rumors. The two groups share the same religion and speak the the same language. Leading up to the genocide, a lot of Hutus felt that they were being treated as inferior to the Tutsis. Many said that the Tutsis looked more European and, therefore, were superior to Hutus. This resulted in Tutsis having more rights than Hutus. A lot of Hutus decided that because the Tutsis were a minority that they could just kill all of them. They were fed up with being treated “unfairly.” In the span of about 100 days, they murdered somewhere between 500,000 and 1,000,000 Tutsis. Although they killed these people with little weaponry other than machetes, it was the most efficient genocide in world history. The killers often called the Tutsis “cockroaches” to dehumanize them. The Impuzamugambi and Interahamwe militias and Hutu government were the perpetrators for the killings. This genocide started with almost no warning. On April 6th, 1994, the killing started. They first killed two opposing leaders: the president of Habyarimana, Juvénal Habyarimana, and the president of Burundi, Cyprien Ntaryamira. Paul Rusesabagina was a hotel manager at Hotel des Mille Collines in Rwanda. Paul was a Hutu, but didn’t agree with the Hutus who were killing Tutsis. He was married to a Hutu woman and had two children who were also Hutu, but him and his wife split up. He eventually fell in love with another woman named Tatiana, who was Tutsi. He had three Tutsi children with her, and she legally adopted his two other children to make one big, happy family. Paul heard the news about the killings from his friend Bik Cornelias on the same day on April 7th. He was shocked, but based on the tension between Hutus and Tutsis he knew something bad was soon to come. His first instinct, then, was to get his wife and kids to safety. He knew some people in the UN through his job as a hotel manager. He called a UN official to ask for assistance, but he said there was nothing they could do. Paul decided that the best place to hide them was at the hotel that he managed, Hotel des Mille Collines. That worked well, and he and his family were well hidden. The next day, roadblocks were set up and militiamen murdered as many Tutsis as they could. A lot of Tutsis came to Hotel des Mille Collines in search of refuge. Soon, there were hundreds of refugees in Paul’s hotel. He was happy to take them all in, but it was difficult to manage so many people. For example, he ran out of water at one point, so he just had the people drink from the hotel swimming pool. It wasn’t perfect, but it was safe to drink. The refugees were desperately thirsty, so they were happy to drink it. He also sent and received mail from the American President, Bill Clinton, and the Belgian King, Philippe of Belgium. They secretly sent him food and other supplies. However, he collected about 1,200 refugees in his hotel, and the Hutus found out. His wife and three Tutsi children were big targets because of their relation to Paul and because they were Tutsis. Some Hutu militiamen threatened to attack the hotel, so Paul thought it was too dangerous for his family to be there any longer. He decided it was best to smuggle them out to safety. He got them to the nearest airport, Kigali airport, in secret. He wanted to be with his family, but he knew that he had to tend to his refugees in the hotel. He had to let his family fly to Belgium, not knowing if he’d ever see them again. He then went back to The Diplomat Hotel once more. Fortunately, the genocide ended soon after this incident. Every single one of the refugees in his hotel survived the genocide. Paul was a true hero; he saved more than 1,200 innocent people from certain death. After he and his family were reunited, they moved to Brussels, Belgium. He went on to win the Presidential Medal of Freedom in America for his heroism. He wrote a book about his experience in the genocide in which he claimed that he is not a hero, but just an ordinary man who managed a hotel. He just wanted to help his guests. Despite that, he’s considered a hero by all of Rwanda and the rest of the world. He made people happy during the darkest days of the Rwandan Genocide.